This example shows how to use an ItemRenderer to display the items in a List in your Royale application. It uses the new Jewel UI set that supports themes and is available in the 0.9.4 release or later. By default, Apache Royale Jewel List-based controls display their data as plain text using ListItemRenderer. 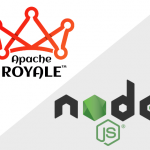 But Royale is capable of much more, and you can extend ListItemRenderer to display the items in your list in a pleasing and user-friendly way. The list gets its items from the data provider and passes them through the item renderer. The item renderer models each item in a consistent way: it adds a FontIcon to display an appropriate icon (selected, in this case, from the Google Material Icons font) at the left, and the text of the item in a Label to the right. To manage the components for each list item, you can use absolute positioning, layout classes or CSS. We used CSS in the fx:Style section in the main file for simplicity. As you see, the item renderer is declared in CSS as well, and is located in the itemRenderers package. Note that we use Data Binding, deploying ItemRendererDataBinding. 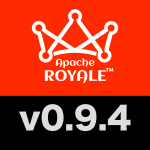 Data binding in Royale is not available by default to reduce code size. You add it where you need it, following the PAYG principle in Royale: Pay As You Go. We add a data binding bead here since we need the function, and not anywhere we don’t need it. The MaterialIconType class uses the icon names as they appear in the Material Icons font for convenience and to avoid typos. One additional benefit of using MaterialIconType in your code is that it injects the font into your html directly, without you having to deal with that step. This class uses a data object (DOT, or POJO, depending on how you name this kind of code), called IconListVO to instance each piece of data that will appear in the List control. In the main file, note how we link the ListsModel class through the model variable accessible throughout Royale to make it easy to link a model as a bead. Finally, we link the model data to the list dataProvider using data binding, with ApplicationDataBinding (since we are at the Application level) and the ConstantBinding class that knows where the data is located (sourceID), what property holds it (iconListData) and where to inject the data (destinationPropertyName).